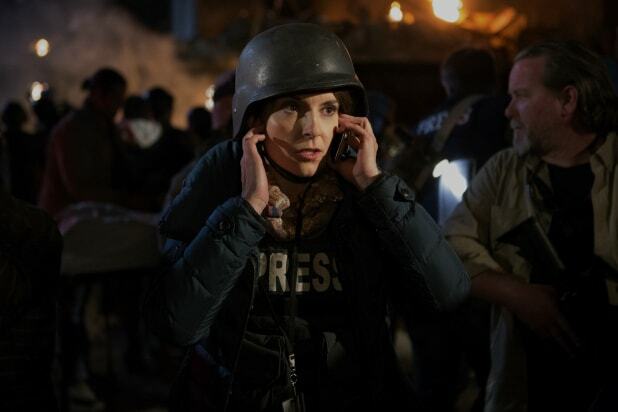 In the savvy comedy “Whiskey Tango Foxtrot,” a New York-based news producer leaves behind a cushy yet frustratingly predictable job for the madness of war-torn Afghanistan, becoming something of an adrenaline junkie in the process. That the producer in this case happens to be a woman doesn’t significantly alter this storyline’s trajectory, and that’s one of the film’s smart, satisfying strategies. Based on Kim Barker’s memoir “The Taliban Shuffle: Strange Days in Afghanistan and Pakistan,” the film gives Tina Fey her strongest big-screen role to date. There are some Liz Lemon elements to the character — Kim is a cubicle drone stuck in a safely repetitive job and a similarly go-nowhere relationship — but she comes into her own on the front line, navigating the madness of the War on Terror and covering breaking news instead of drafting copy about yet another story on the dangers of high fructose corn syrup. The only reason Kim gets shipped to Kabul in the first place is because she’s one of her (unnamed) network’s news staffers without a spouse or children — a revelation that brings one of her co-workers to tears — and while Kim’s initially wet behind the ears, she quickly learns to navigate both the battlefield (via no-nonsense Marines general Billy Bob Thornton) and the corridors of power in the “Ka-bubble” (as represented by lecherous bureaucrat Alfred Molina). 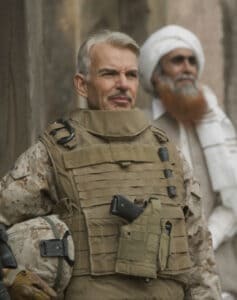 The dialogue is fast and darkly funny – “It’s all about hearts and minds – the two best places to shoot people,” one Marine tells Kim – and while our heroine falls for a fellow reporter (played by Martin Freeman), “Whiskey Tango Foxtrot” refuses to bog down in a love story. Neither does it suggest that Kim’s increasing desire to be where the action is somehow negates her femininity. Covering the Taliban as a woman, of course, presents a unique set of challenges, particularly when a crowd of angry men turns on a burqa-clad Kim, who’s filming a public rally where clergy shoot at televisions. There’s a strong case to be made that the roles played by Christopher Abbott (a scene-stealer as Kim’s sensitive, locally-based translator) and Molina should have been played by more ethnically appropriate actors, but both men deliver solid performances that resonate in spite of those casting decisions. The acting is universally excellent, particularly Fey, who’s shrewdly fulfilling our expectations while playing off them. Also worth a mention is Margot Robbie, whose gorgeousness supports an amusingly pointed plot element that recalls the cynical trajectory of “Broadcast News,” and she continues to make her mark as a sure-footed character actor. Coming off her powerful and underseen turn in “Z for Zachariah” — as well as her hilarious bathtub cameo in “The Big Short” — Robbie scores again with a supporting role as a rival correspondent who welcomes Kim as an all-too-rare fellow female covering the Taliban. It’s tricky to locate a comedy in the middle of a war zone, but cinematographer Xavier Grobet splits the difference, accurately capturing the sun-baked deserts and shadowy alleyways without rendering the atmosphere so bleak as to elicit despair. Tonally, it’s in keeping with Carlock and the directors’ finessing of dry wit out of tense environs, and the film’s success comes out of never veering too far toward either extreme. It’s wiser than the confusion its title suggests, and it pushes Fey toward a film career that’s as uncompromising, unpredictable and intelligent as her TV work.